Cape Engaño Lighthouse, also known as Faro de Cabo Engaño, (Filipino: Parola ng Cape Engaño) is a historic lighthouse located at the Palaui Island in the town of Santa Ana, the province of Cagayan, Philippines. Located at the northernmost part of Luzon Island and situated atop the summit of a hill, 92 meters above sea-level, the lighthouse provides a 360-degree view of Babuyan Island and the Dos Hermanas Island (Two Sisters) on the North, Pacific Ocean on the West and Engaño cove on the East. Cape Engaño Lighthouse is now under the supervision of the Department of Transportation and Communications through the Philippine Coast Guards' lighthouse division. Faro de Cabo Engaño is one of the four lighthouses built during the Spanish Colonial period, which served as gateway lighthouse for incoming ships. The construction started on 21 September 1888 and finished on 31 December 1892, where in most of the laborers are Filipinos. According to the Jamorabons,the name of the lighthouse was given by Spaniard seafarers when they first set foot on the cape and were so stunned by its natural beauty that they named it "Engaño". It is initially designed by Engineer Magin Pers y Pers, who also designed Cape Bojeador and Capones Island but was continued by Guillermo Brockman. The Lighthouse complex is composed of the housing pavilion (served as an office and workers quarter), the service buildings (served as kitchen and storage) and the 11-meter octagonal tower which houses the crown and the copper lantern (but was now a solar-based lighting mechanism) that is visible in all angles of the lighthouse. This was all built using local materials, masonry and hardwood. ^ "Cabo Engaño/Cagayan Light". Amateur Radio Lighthouse Society. Retrieved on 2010-06-27. ^ "Faro de Cabo Engaño". ICOMOS. Retrieved 2 May 2014. ^ "Faro de Cabo Engano". Filipino Heritage Festivals. Retrieved 2 May 2014. Rowlett, Russ. 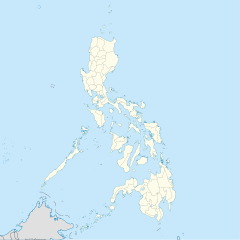 "Lighthouses of the Northern Philippines". The Lighthouse Directory. University of North Carolina at Chapel Hill. Light Stations of Northern Luzon at the Philippine Coast Guard Website. Wikimedia Commons has media related to Cape Engaño Lighthouse. This page was last edited on 3 November 2018, at 07:06 (UTC).